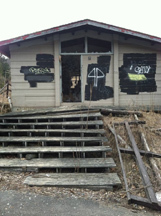 One of the latest inductees into the shrine of lost ski areas is Mt. Tom. There is no clear-cut reason for the closing of it. Yes, there was a quarry located next to the ski area, and yes, the mountain wasn't making megabucks. But still, both weren't great reasons for its closing. 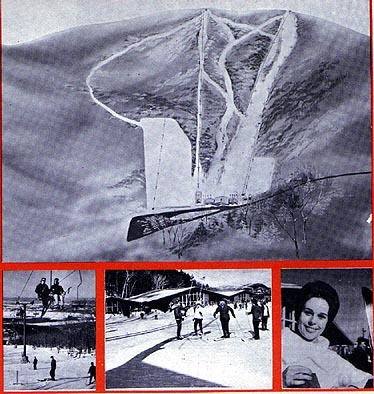 The quarry had been there for years and could have still remained in harmony with the ski area. Also, the mountain wasn't in any real financial trouble. But, regardless, Mt. Tom is closed and won't likely ever open again. Mt. Tom's lighted trails for night skiing. 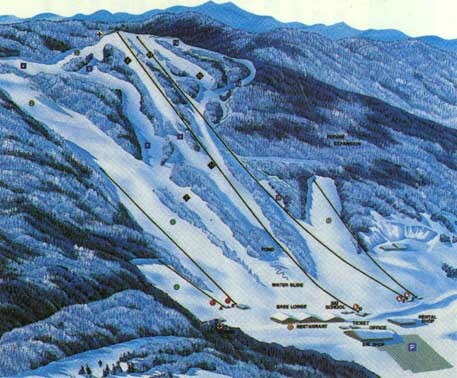 Our earliest reference to the ski area is the 1962 Eastern Ski Map, which states that Mt. 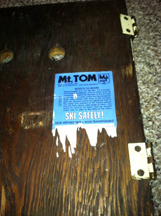 Tom had a double chair, T-bar, rope tow, 3 slopes, and 1 trail, along with snowmaking. The next year brought another rope tow, trail, and slope. Mt. Tom in 1968. 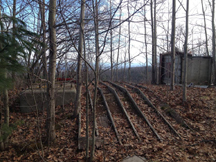 Two double chairs are shown, along with a rope tow and T-bar. 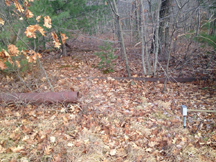 The old double was one of the center pole variety. 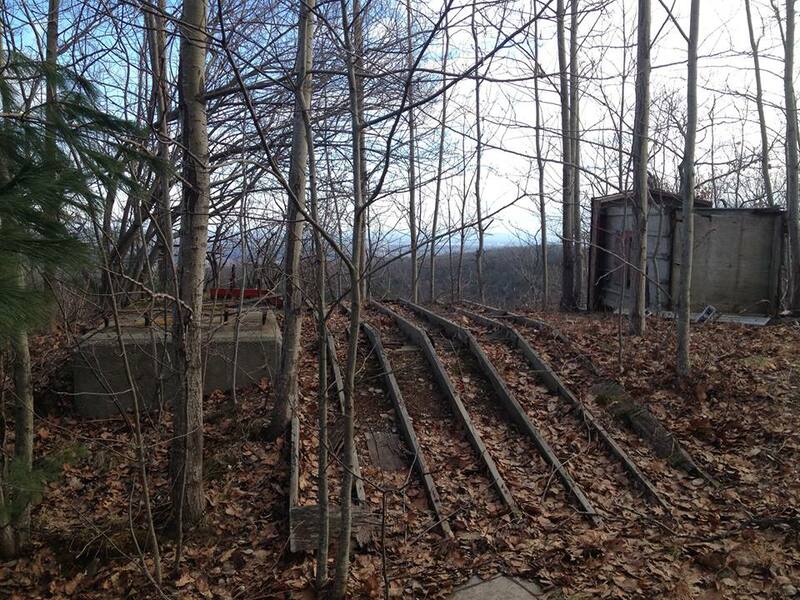 By 1969, the mountain had added another double chair, T-Bar, J-Bar, 2 slopes, and one more trail. 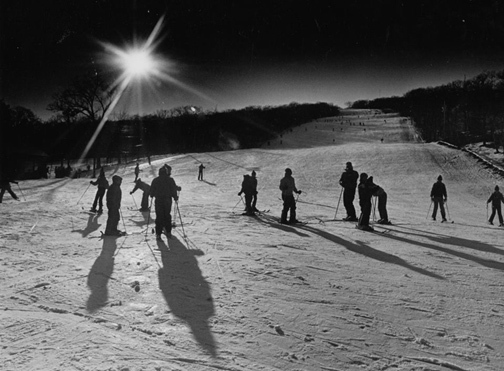 In 1973, four more trails were cutting, boosting stats up to 6 slopes and 7 trails. 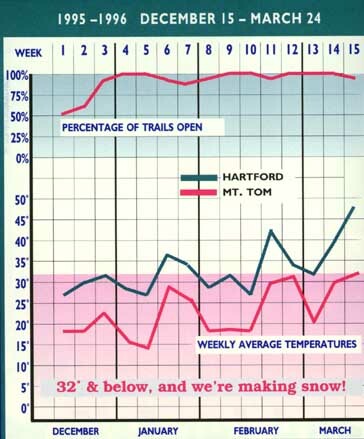 Another chairlift was added before 1980, and when 1987 rolled around, there were 17 trails. 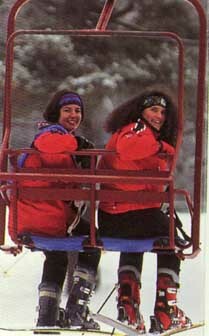 A few years after, a T-Bar was replaced with another double chair. One of Mt. Tom's double chairs, mid 1990's By the time the mountain closed, all of the T-Bars were gone, as the mountain was serviced by 4 double chairs and a J-Bar. 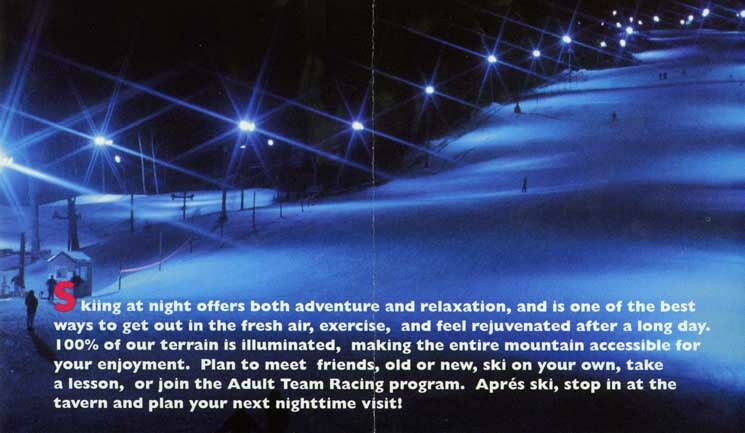 Also, there was night skiing and snowmaking on all 15 of the trails at the time of the closing. Although the mountain was small (680 foot vertical drop) and not too challenging (avid skiers called it a cross-country ski area), it was in a great location and was open during the summer with a wave pool, a set of water slides, and an alpine slide. 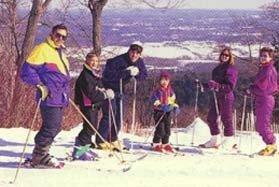 Many of its skiers came from Connecticut and the greater Springfield, MA area. 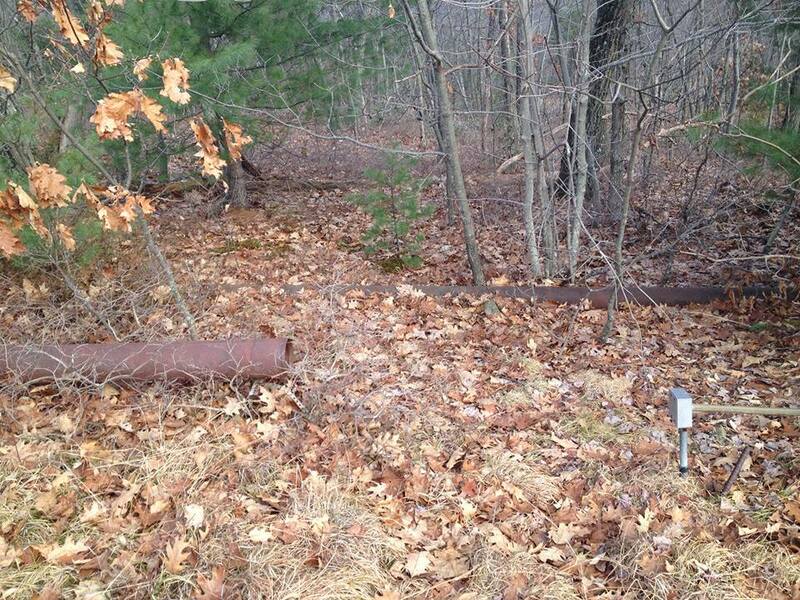 Future expansion was planned above the quarry area, however, due to the closing, these trails were never finished. Recent struggles for the quarry make the closing of the ski mountain seem more and more of a bad decision, as the owners cannot get permission to expand it. The first parts of Mt. 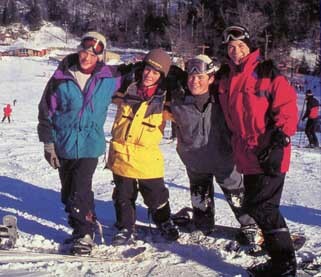 Tom were sold before the 1998-99 ski season, as Berkshire East Ski Area purchased a fleet of six Areco snow cannons and the rental inventory. 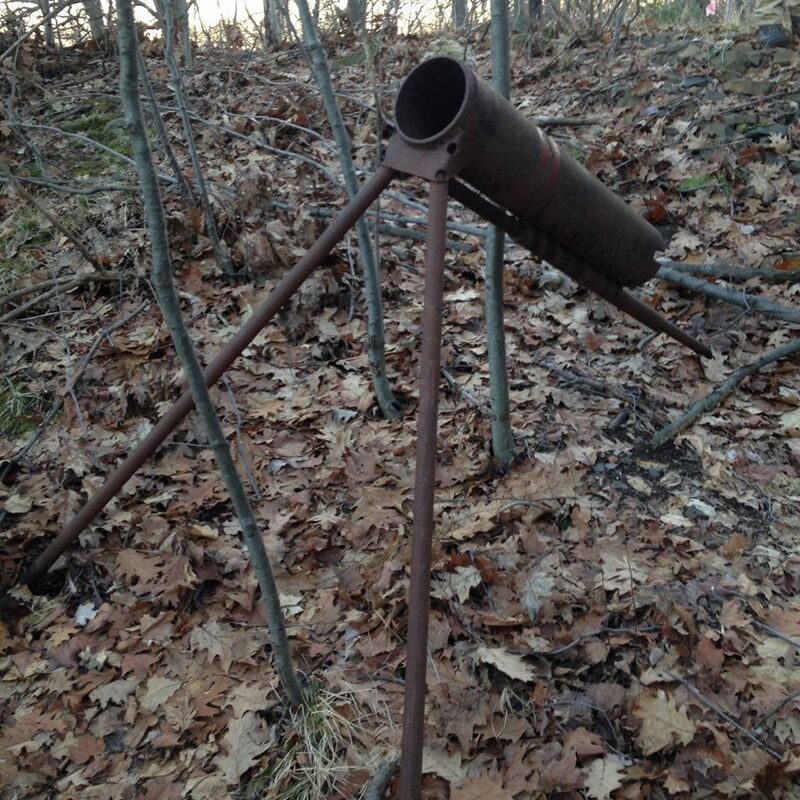 With much of the snowmaking, lights, lift accessories, and parts now sold, along with a warming climate, little hope remains for a re-opening of this once-popular mountain. Many of its skiers either have stopped skiing, travel up north/west, or go to nearby Berkshire East Ski Area. Good luck in driving up to Mt. Tom now, as the entrances are blocked. The only way you will see the remains of the mountain is by looking out your car window as you drive by. It was a great little area, but its time has passed. Here's the Terraserver image of the area as it appeared in the late 1990's. You can see the waterslides at the bottom left. John Johnson: "I just want to drop a line thanking you for your web site. Although I am not surprised by the closing of Mt. Tom, I am disappointed to just find out about it from your web site. I skied this area from the time I was 10 until I was a junior in high school (1983). Looking over the trail map brought back a lot of memories as well as testing my memory for naming the trails. gotten from the ski area." Sean O'Malley: I spent my formative skiing years on Mt. Tom and have many fond memories of the area. My father, Bob O'Malley, worked hard to convince Dan O'Connell that his quarry had great potential as a ski hill. Dan ultimately developed the area and expanded it over the years. In later years, Dan Jr. directed the operation. Cal Coniff, who directed the NSAA for many years, was (I believe) the first general manager. Cal was an elegant skier and a fine manager (and he pulled my ticket on number of occasions for jumping or skiing out of bounds). Mt. Tom was a great "babysitter" for many of the youth in the Holyoke-South Hadley area. Growing up on Mt. Tom helped me to develop an appreciation for skiing and the outdoors that continues to influence me today. And I know my life is far richer (and I am sure far different) due to the many hours I spent under the lights running gates and dodging snow guns. A February, 1985 view of the Lower Tom Slope. Courtesy of Jim Gleason. Click on the photo for a larger version. 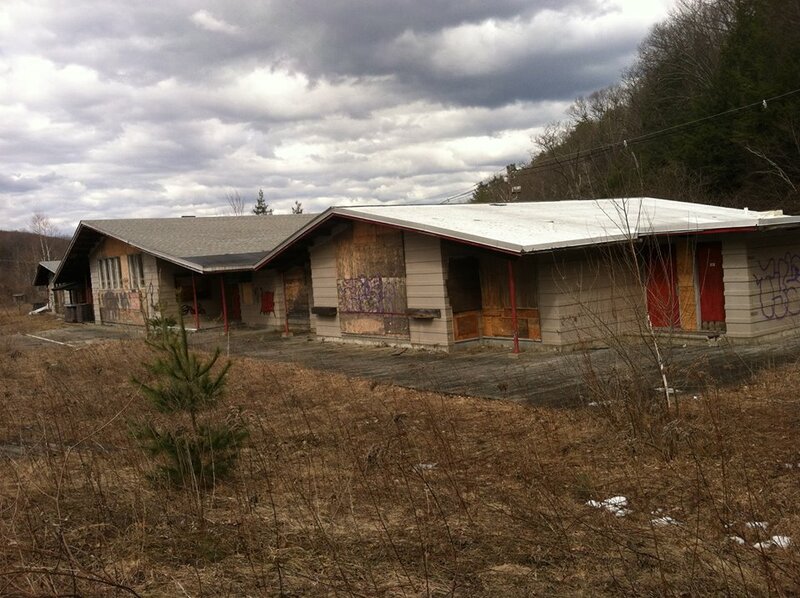 Thanks to Matt Cavallo who sent in these recent photos from 2013 regarding Mt. Tom. Click on each for a larger version. 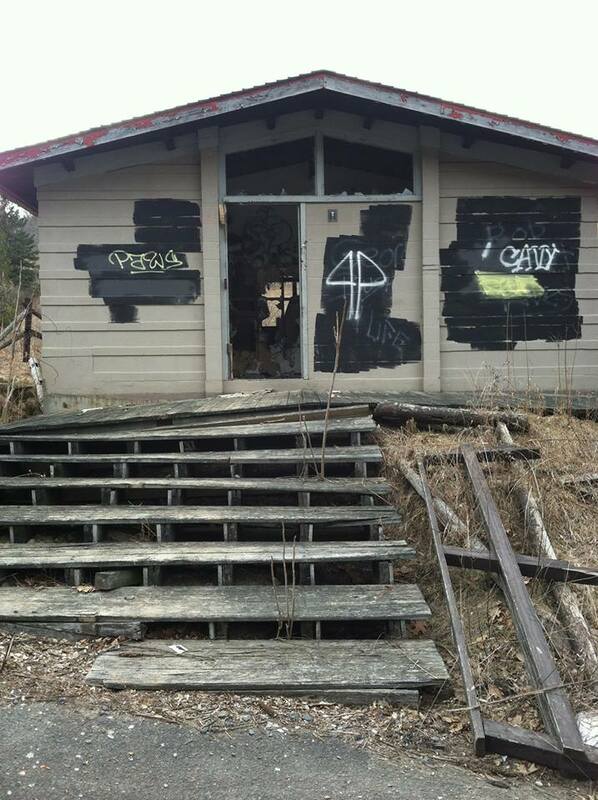 As you can see, the lodge is in rather rough shape. Old Ticket. 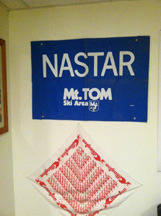 From Matt: The large blue banner picture was one of the original racing "gates" used when skiers would race down the race course (my uncle was a race instructor at Mt.Tom when it was open) Lodge. Rental building. Unloading ramp for the top of the 1500' Beginner Chair near the quarry. 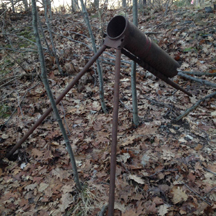 Snowmaking pipe on the Big Tom Trail. 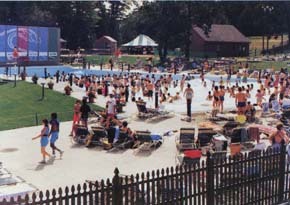 Portable sow gun/cannon above the wave pool.